I finished this last painting on the Winter Solstice yet have not released it as I was “told/guided” to create a video and audio explanation of it and other mandalas created recently. For anyone who has worked with audio/video production (beginner or professional) you know what a slow and frustrating process it can be……patience is the virtue most definitely! There has been some incredible information “downloaded to me” during the painting of this one particularly. Because of the depth and potential applications I have been shown it will be researched further before going public. 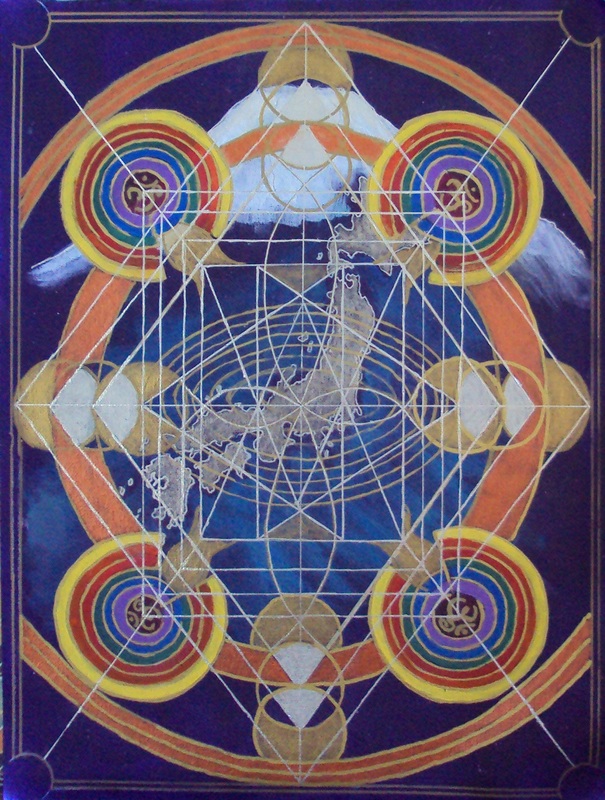 I cannot take full credit for the revelations within matrix mandala as it manifest itself through what I have recently learned and observed in the work of Michael Tellinger in South Africa, Tom Kenyon’s Meditation for Japan, Tesla’s Free Energy and the use of specific minerals, sacred geometric combinations and harmonics and the many years of work and research with sound and energy healing. The end result is a short 7 minutes describing the process and layers involved in this particular piece and the dowsing experiment I did with other paintings. Before starting I had no idea of what exactly would be revealed. It has proved interesting! In a day or so I will have the video link on my website Earth Spirit Journeys and on my Deviantart site – tonight I just could not get any more out of me. I hope you find the video interesting and the images powerful. More about all of this will follow shortly. As the World at large honors the Life, Heart, Soul and Essence of a truly amazing man NELSON MANDELA – by the end of next week there will be hardly any words left to say or write of his life, the faults he is sure to have had as all of us have, of his courage and patience living within a small room for so long, of his political beliefs, aspirations and achievements in bringing the huge color division and social sigmas of a Black and White country together. Through pain, strife, anger, hatred, violence, power and greed he gave strength through example to all people whether rich or poor, free or slave. Now the only course of action for Humanity – US as the people of a profound Earth and the WORLD LEADERS of every country, religion, corporation and military establishment is to EMULATE THE PATH AND EXAMPLES SET BY NELSON MANDELA, the very things everyone will be praising and remembering. Although it is not only for world leaders to walk in such a way. We should all try to emulate such humility in our own lives thus exampling through the highs of success and the lows of despair. Talk is cheap, shallow and useless if not backed up by action to raise higher and emulate those who deserve to be in such high regard. Such an Eulogy would serve as confirmation that Nelson Mandela’s life has truly left a mark of greatness on the lives of all. WE SHOULD DEMAND NO LESS OF THOSE IN POSITIONS OF LEADERSHIP AND AUTHORITY. HUMILITY IS POWERFUL! After my last posting some of you must have thought I had lost some marbles! Why would she post such a thing! I asked myself the same question after hitting the send button and seeing it online. OMG!!!! As part of a minor explanation and reasoning: Recently I have been shown the need to get out of my way, let go of some fixations to open some new doors. I couldn’t quite figure out exactly what this all meant and what the fix was! So what happens is that, if I pay attention, though a series of odd messages, happenings and meetings all seemingly unrelated I get an idea or theory or topic to follow that gets me out of the way. This was it, plus I needed to pay attention to my health in a different way and subsequently some other pieces have been revealed which are also seemingly unrelated to this topic, yet now I see those directions expanding. All that said I will share what the last two days of experiment have revealed. This morning I did receive an unexpected email containing a series of messages between other people on this topic and similar concerns. So it is also this prompting me to continue to share. After the first day the protocol stated was followed very first thing in the morning before any liquids or teeth cleaning. Day 2 the results got scary because of the increase in “stuff” and additional white bubbles looking like crystals. I will only share one photo as it is p retty gross. Day 3 (today) I followed the protocol with a sense of dread wondering if it would reveal a worst scenario. I was surprised there was a marked decrease in “stuff and bubbles” both in the first sample (before swishing) and the second sample (after swishing). Obviously I don’t have any way of testing the sample yet my intuitive and unscientific (probably accurate) observations are that the Sesame Oil Pulling has an effect in clearing this up. To qualify a little further. In the first post I mentioned doing Oil Pulling in the past to relieve a toothache and gum infection. I was using Coconut Oil at that time. Since using the Sesame Oil I see, feel, sense, know (whatever the right words) is more effective, tastes better and works faster. Follow the links for more information and please do your own research, test this for yourself before calling it bad, good, unproven or conspiracy science. Don’t misunderstand me here, testing and research with integrity are absolutely necessary yet balanced with living logic and intuitive observations to reveal something that is not present or seen yet and allowing for this healthy cycle to flow between the seen and know and unseen and unknown making way for even better abilities for testing and research to occur.